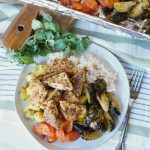 If you’re a peanut butter lover, this one is for you! 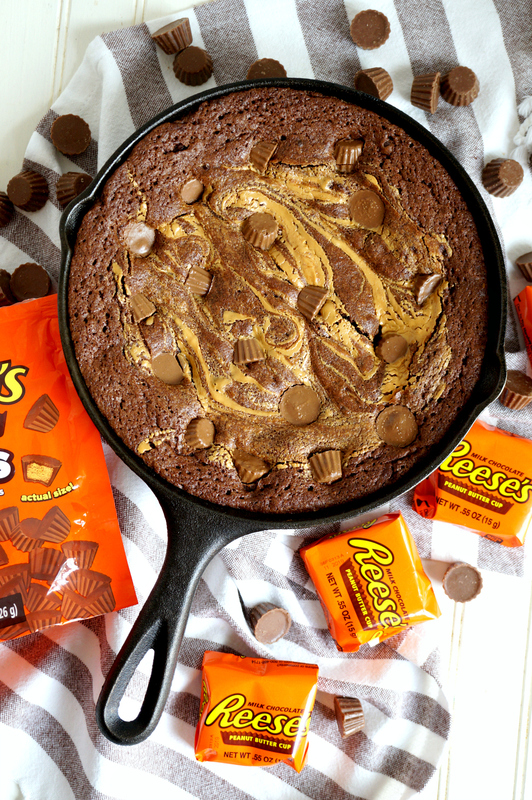 This Reese’s Stuffed Peanut Butter Skillet Brownie is hiding a whole layer of melted Reese’s cups in the center! Hi buddies and happy Monday! I am so excited to be pairing up with Kroger and Reese’s today in preparation for the NCAA tournament. 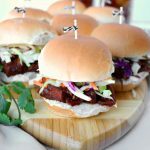 While I’m no sports expert, I do love throwing a fun watch party… any excuse is a good one to get together with friends! 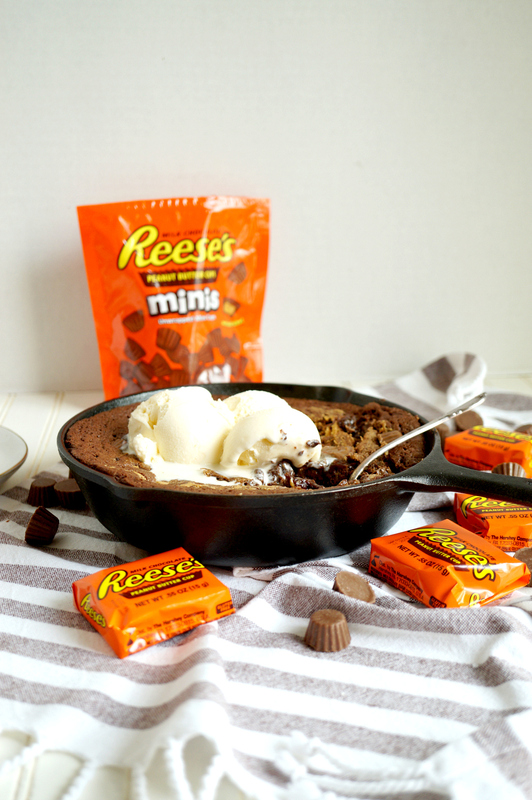 Today, I am sharing this delicious Reese’s Stuffed Peanut Butter Skillet Brownie which is delicious, so simple to make, and perfect to share with friends while you watch the game. 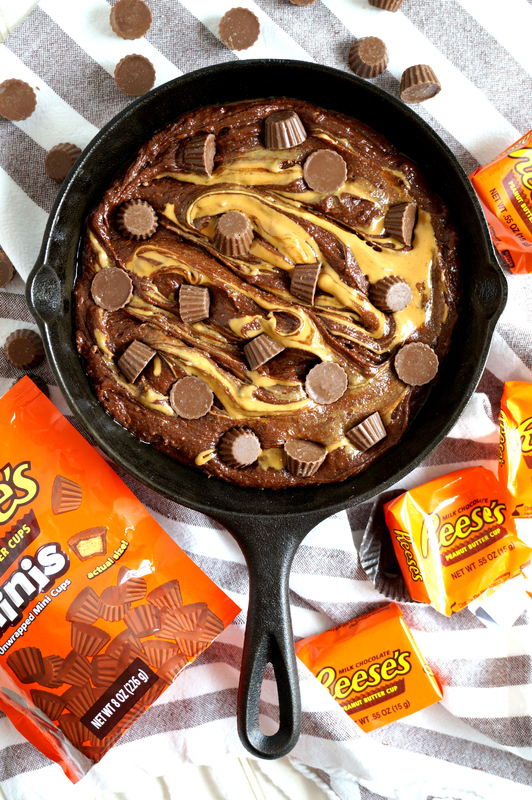 This decadent peanut butter skillet brownie has a yummy surprise in the center – a whole secret LAYER of Reese’s Peanut Butter Cups is hiding in there! 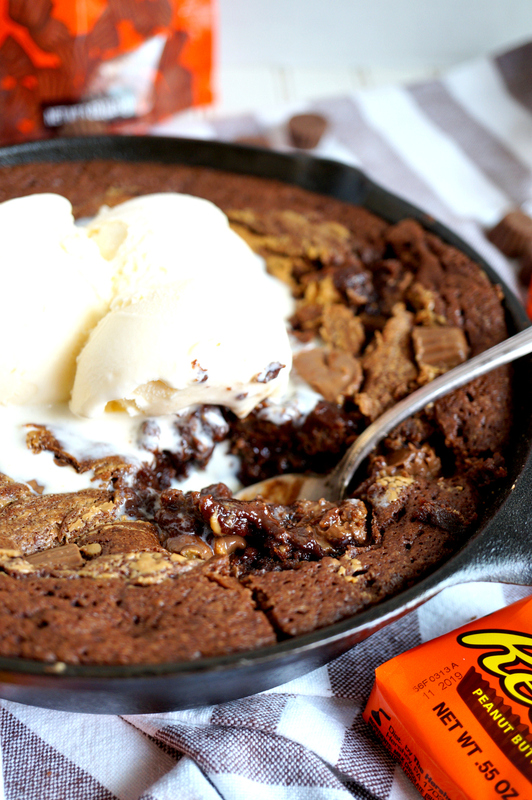 When you cut into the brownie, you’re rewarded with gooey, decadent melted chocolate & peanut butter. It’s kind of the best thing ever! To add to the deliciousness, I also swirled some extra peanut butter on top, and sprinkled on Reese’s Minis for the perfect finishing touch. To grab all the necessities for this peanut butter brownie, I headed to Kroger! I bought original Reese’s Peanut Butter Cups as well as Reese’s Minis, and all the ingredients for the brownie including cocoa powder, butter, and eggs. Make Kroger your one stop shop for your NCAA entertainment needs, and throw your very own Tastes of the Tournament party! They make it super easy, and all your food and beverage needs are just a click away. No matter what you ‘re making for your get-together, make sure this yummy brownie makes the cut! 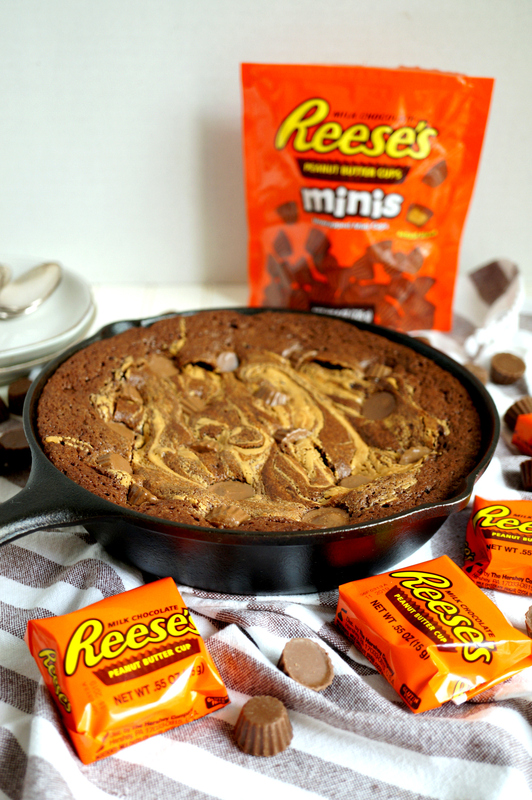 I hope you guys enjoy this Reese’s Stuffed Peanut Butter Skillet Brownie! 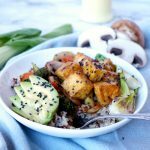 In a pinch, you can even (gasp!) use boxed BROWNIE MIX to make this even simpler. 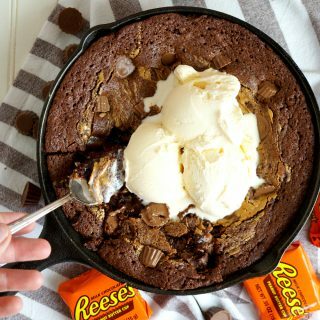 I won’t tell 🙂 To change it up, you can even use white chocolate or dark chocolate Reese’s cups instead. Or use a mixture of all! The possibilities are endless (and all delicious). I hope you love this. I know we did! These brownies really are too good to keep to yourself, so share them with more than just friends and family at your Taste of the Tournament Party, using hashtag #TasteoftheTournament and visit www.TasteoftheTournament.com for more game day ready recipe inspirations! Also check out these Kroger Digital Coupons to save some money when you buy Reese’s! 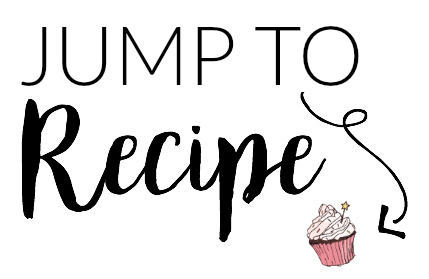 Looking for more chocolate + PB recipes? 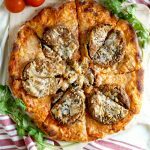 If you're a peanut butter lover, this one is for you! 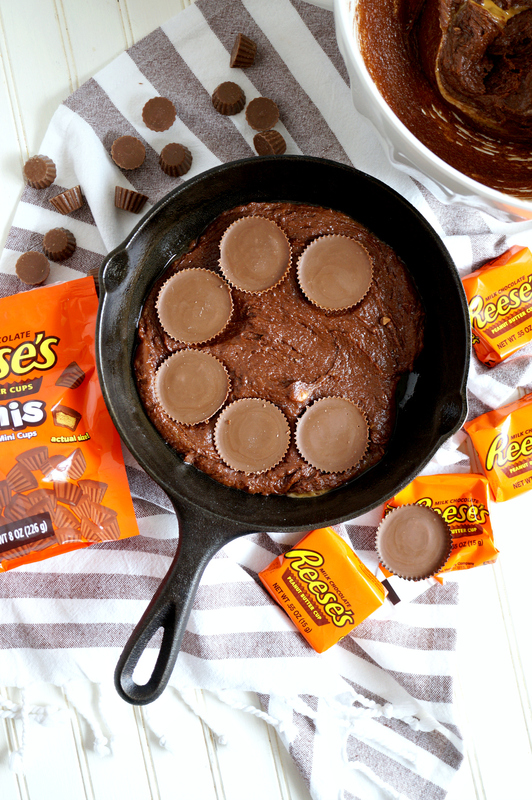 This Reese's Stuffed Peanut Butter Skillet Brownie is hiding a whole layer of melted Reese's cups in the center! Preheat oven to 350F, and spray an 8" cast iron skillet with nonstick spray. 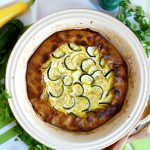 If you don't have a skillet, you can also use an oven safe 8x8 baking dish. In a large bowl, mix together the sugar, cocoa, flour, salt, and baking powder. Add in the melted butter, eggs, and vanilla, and mix well until a thick dough forms. 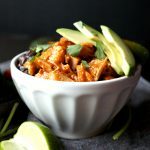 Stir in the 2 tbsp of creamy peanut butter. Spread half of the brownie batter into your skillet or baking dish. 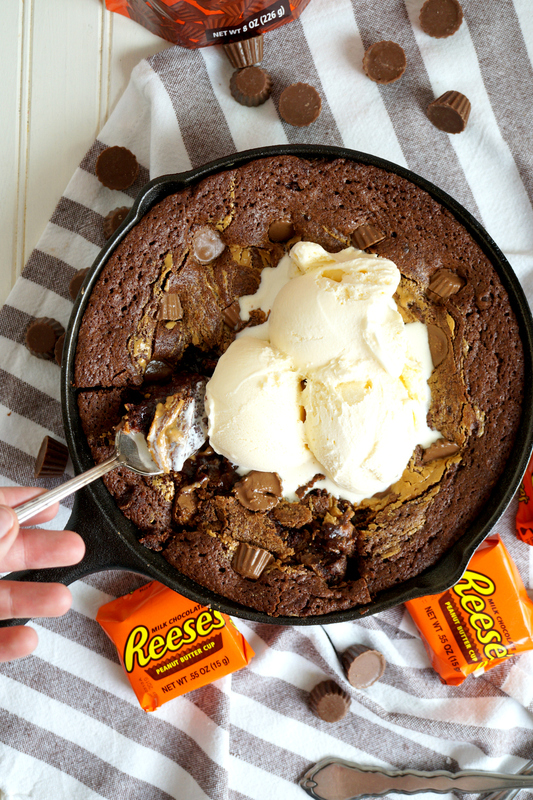 Top with a layer of unwrapped Reese's cups, then spread the remaining brownie batter on top. Drop spoonfuls of the reserved peanut butter on top, and gently swirl it into the batter. Finally, sprinkle on the Reese's mini cups. Bake brownie in preheated oven for 25-30 minutes, until the top appears dry and a toothpick inserted in the center comes out with just a few crumbs. It's ok if the center appears a little jiggly, as it will solidify as it cools. Let brownie come to room temperature, then enjoy!